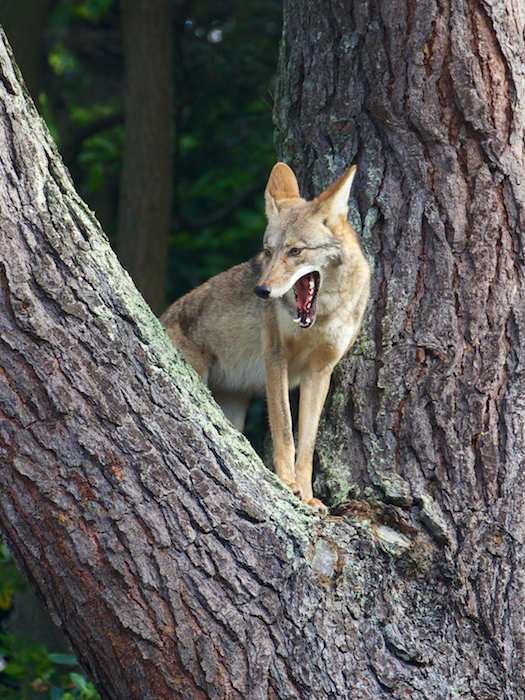 Coyotes don’t regularly climb trees, but if a coyote is motivated — for instance, if it is after a squirrel — it can get higher in a tree than you might expect. 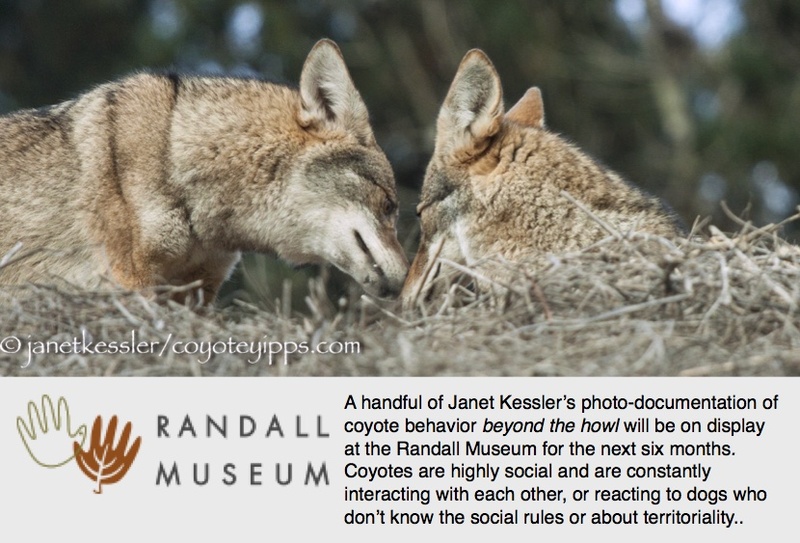 Coyotes can jump high and they have very sure footing. The crook in the trunk of this tree is about 6 feet off the ground — I measured it — the foliage in front of the base of the tree hides how far up that coyote actually is. 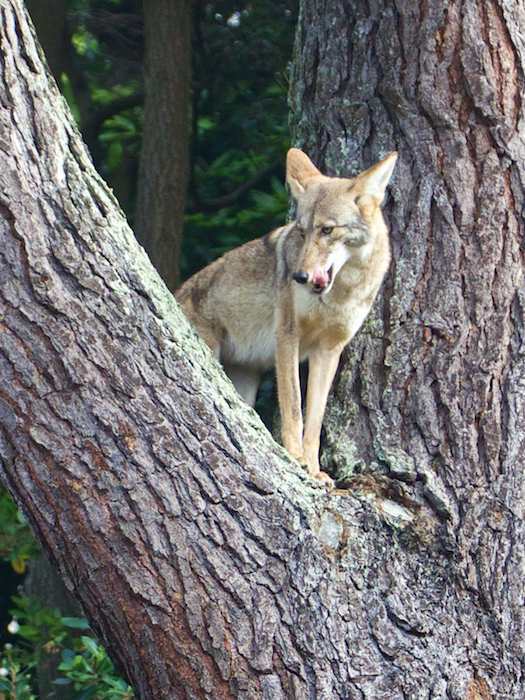 The coyote was able to leap up and then use her forepaws to grab the rough bark of the tree and boost herself into this spot. 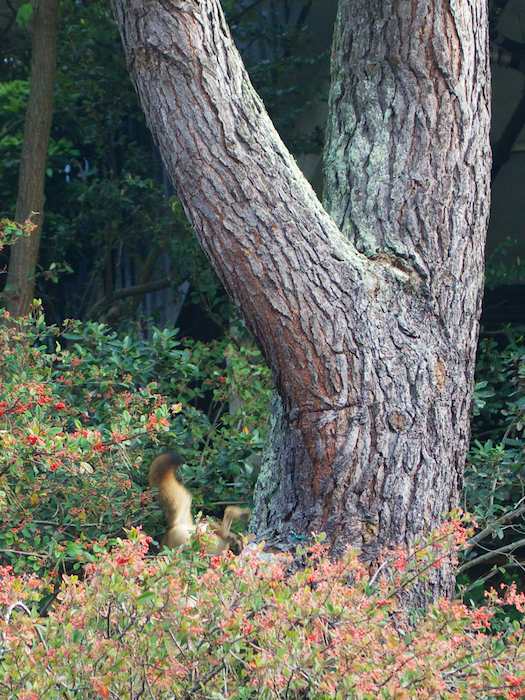 The squirrel, of course, being a better tree climber, scampered up higher and got away. It would have been difficult for the coyote to go higher than this, though, technically, she could have made it to the next branch up in the same manner she made it this far. But when she got this high, she stopped. She must have liked it, because she stayed and looked around, with a new higher vantage point than normal. She kept looking up for the squirrel. Maybe she was hoping the squirrel would drop — it has happened before when a squirrel lost its footing. She waited and waited, but it didn’t happen. So she licked her chops anyway, yawned, jumped down and went on her way without the squirrel she was hoping for. Here is a photo of that same tree trunk taken a little later in the day from the backside so that you can better see the distance that coyote leaped. I took a measuring tape to measure the height of the crook: it was six feet above the ground. The bushes hiding the length of the trunk are some distance in front of the tree. In Arizona, it’s not unusual for coyotes to climb orange trees (or other citrus trees) and eat the oranges! 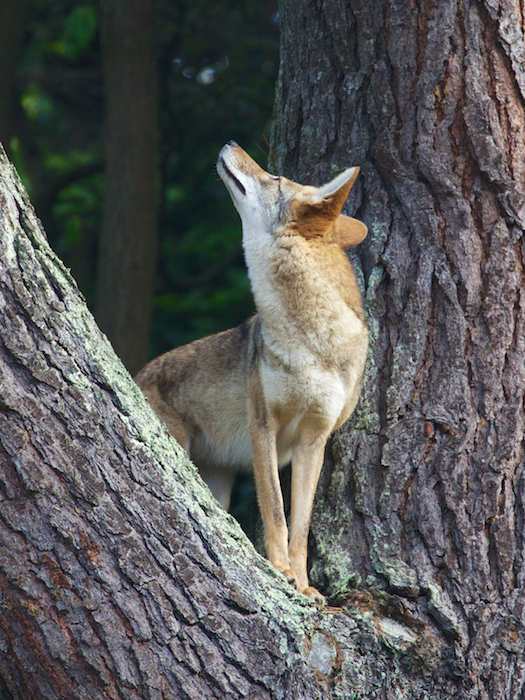 Also in desert canyons, coyotes will often climb up into the leafy tops of trees during the hottest part of the day.